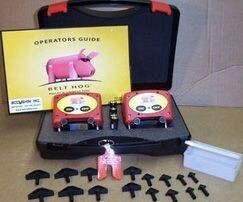 Accushim's Belt Hog makes it simple to align belts and pulleys. You won't have to remove the belts to make quick, accurate adjustments over distances of 6" to 20 feet. One person can accomplish an alignment with no training other than reading the short instruction manual. Belt Hog mounts in the grooves-right where the power is transferred. Groove mounting makes it simpler to keep everything parallel. Belt guards can often be left on, and pulleys on shafts set in different directions can be aligned just as easily. Bright dual LASER beams let you know when you've got things straight. This little 1.6-pound tool is a heavyweight when it comes to making things simple. You've heard of living high on the hog? Welcome to working high on the Hog. Housing Material: Precision molded PA Dimensions: 2.68 x 3.62 x 2.65 in (h x w x d) Weight: approximately 1.66 lbs Battery type: (2) AA batteries Operating time: 20 hours continuous operation Measuring distance: 6" to 20 feet Measuring accuracy: Better than 0.5mm or 0.2 degrees Pulley diameter range: 3" and larger Pulley belt groove with: A, B, C, D, and E sizes (0.2" - 1.6") Classification: Class 2 LASER Output power: <1mW LASER wavelength: 630 - 675 nm Belt Hog Alignment Procedure The Belt Hog uses two LASER transmitter for projecting of LASER lines on the opposite LASER unit. By adjusting the pulleys so that the laserline coincides with the reference line on the opposite LASER unit, the pulleys are aligned. Mounting of the Belt Hog units Each unit is mounted on the pulley as shown in the diagram below. Note: The magnets, which holds the unit to the pulley, are very strong. Do not pinch your fingers! Position both units with the spring action probes resting in the same groove on both pulleys and the units are facing each other as shown below. When the units are mounted, turn on the LASERS. Each LASER generates a line on the opposite unit. When correctly aligned the lines coincide with the reference marks on the labels on both units. If the belt transmission is mis-aligned, start by correcting the angular error. Never stare directly into the LASER light source. Never direct the LASER into anyone else's eyes.